Think of an extreme environment where life survives in the ocean. What springs to mind? The mind boggling pressures and eerie quiet of the deep-sea perhaps? Maybe the icy environments at the poles? Possibly even an estuary, where organisms are flung from one salinity extreme to the other on a daily basis. There is another extreme environment though, one which few of you probably even considered, one that covers about 30% of the planet and is currently expanding under the influence of climate change: large swirling systems of rotating currents that occur in the centre of oceans known as subtropical gyres. In subtropical gyres, which are sometimes referred to as ‘biological deserts’, the problem for organisms is not pressure, temperature, lack of light or fluctuating salinity. The problem here is a lack of nutrients in surface waters: phosphate, nitrate and sometimes iron. When nutrients are in short supply phytoplankton cannot grow quickly, and the whole food-web suffers. Consequently, large marine creatures are relatively rare here. Nutrients are in short supply because there are very few inputs. 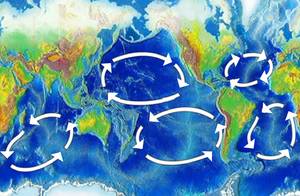 The position of gyres away from land means that the amount of dust deposited in surface waters is insignificant, and the rotation of water within the gyre tends to prevent water being mixed in from adjacent waters. If nutrients can’t enter from above (the atmosphere) or the side, the only other option is from below. Unfortunately, there isn’t much joy here either. Have you ever been in a swimming pool on a hot summer’s day, and noticed that there is a sharp difference in temperature between the shallow and the deep water? The same thing happens in the subtropical gyres: year round high temperatures heat the surface waters and prevent them from mixing with deeper, cooler, nutrient-rich water. Mixing does occur now and then, but these are a sporadic, non-reliable source of nutrients (akin to an occasional swimmer stirring up a swimming pool). Compared to the coast, where marine life abounds, the subtropical gyres are oceanic deserts then. Not many large organisms can survive here, as there simply isn’t the energy (from lower down the food chain) to support them. This isn’t to say that life isn’t abundant though: the subtropical gyres are dominated by microorganisms. The smallest phytoplankton (especially the cyanobacteria, Prochlorococcus: the most abundant photosynthetic organism on earth) are ideally adapted to make the most of what little nutrients are available, as their small size translates into a high surface area to volume ratio. In addition to forming the base of the food chain, when they die, bacteria are very quick to feed on them. In this way, nutrients are quickly recycled and very few nutrients ever sink out of the light-bathed surface waters of the gyres. There are a few other tricks that organisms (especially photosynthetic ones) can use to get by on very small quantities of nutrients here: some reduce the amount of nutrients that they need, often using more abundant elements to replace the ones that are scarce; others form symbiotic relationships (e.g. with nitrogen fixing bacteria); and many photosynthetic algae in these environments obtain nutrients by eating other organisms. In fact, it was recently discovered that algae are THE major predator of bacteria in the subtropical gyres, turning the whole way we view the food web in these environments on its head. In these environments, algae act as producers of organic matter and predators at the same time: they have their cake, and eat it too. So just like many other extreme ocean environments, life, in subtropical gyres, finds a way to cling on. Maybe many ‘extreme environments’ only seem that way because we do not see life existing in forms immediately recognisable to us. However, almost everywhere we look on this planet, microorganisms abound in great numbers — just look at the recent discovery of how abundant bacteria are at the deepest point in the ocean. I am sure that the more we study microbes in these extreme environments, the more amazed we will be by the ‘box of tricks’ that they use to survive.